For the past few months, Google Adsense has been gradually inviting publishers to integrate their AdSense accounts with Google Analytics. 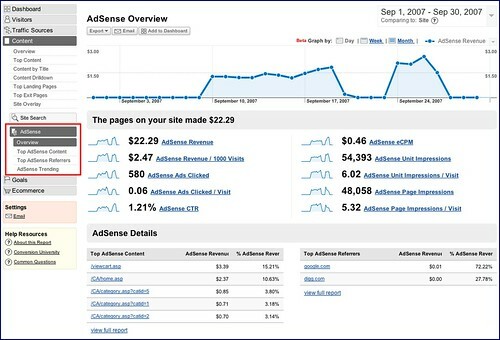 On April 29, 2009, Google has announced that this feature is now available to all publishers on its Adsense blog and Analytics blog. At the main page (“Reports”->”Overview”), you will see a link “Integrate your AdSense account with Google Analytics”, click on that link. The Top AdSense Content report allows you to see more details about specific pages on your site and analyze ad performance. For instance, if you find that some of your pages generate a high number of pageviews but aren’t monetizing as well as other pages, you can focus your optimization efforts on improving these pages. The reports are pretty comprehensive and detailed. You can now analyze your site content by keywords, page, and etc to find out what kind of content can make you profit the most. Enjoy the new feature and happy earning!